Peter is an integrated petroleum geoscientist and engineer with interests and experience in petrophysics, statistical applications, sedimentology & stratigraphy, subsurface modelling and flow simulation. As a Senior Teaching Fellow in Petroleum Geoscience and Petroleum Engineering his time is focused on the two taught masters courses. Peter teaches the "Introduction to Petroleum Geology" and "Well Log Petrophysics" courses, leads petroleum engineering aspects of the Wytch Farm Field Development Project (Phase 1 to 3) and contributes to a number of other lecture courses. Peter co-leads field courses to the Wessex Basin for Petroleum Geoscience and Petroleum Engineering, and Metal and Energy Finance MSc students. 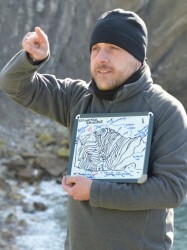 He also co-leads the West Texas / Oman carbonate field course for the Petroleum Geoscience students. Peter is the Postgraduate (Taught) Tutor for ESE, supporting masters students with pastoral and personal/professional development aspects throughout their time at Imperial. He is also a Mental Health First Aider, and co-ordinates MSc elements of the ESE Mental Health Awareness Team. By supervising MSc research projects Peter continues to explore his interests in (1) the characterisation of complex hydrocarbon reservoirs through their sedimentological and petrophysical properties; particularly the application of geostatistical techniques to the identification and quantification of key features (heterogeneities) in the subsurface, and (2) investigate which heterogeneities are important controls on fluid flow through carbonate rocks at different scales, and in various hydrocarbon production scenarios; looking to identify what geological and physical property heterogeneities should be captured in subsurface reservoir models.